The Honour Roll commemorates those from the church who enlisted in World War One. Note: The Reverends` listed on this roll were incumbents of other churches before serving overseas during the First World War. The Victorian Heritage Council states two Honour Rolls in the church record the names of men who fought and died for King and country. 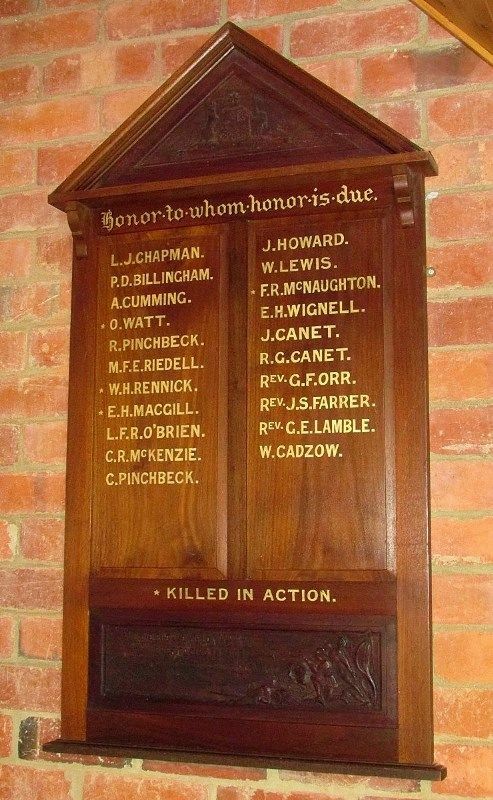 The smaller Honour Roll, possibly removed from a Presbyterian church, has the names of 21 men, four of whom died on active service, including Gunner Edward MacGill who was killed in action near Ypres in Belgium on 20 September 1917 and Frederick Robert McNaughton killed in action on 14 May 1917; both men listed their religion as Presbyterian.